The event took place during the International Exhibition of Weapons Systems and Military Equipment — KADEX-2018 held in Astana. 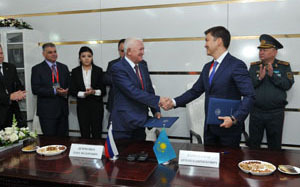 General director of Kazspetsexport Arman Ramazanov said: “Military and technical cooperation between Kazakhstan and Russia serves the interests of both states and is based on a solid legal framework established within the framework of the Collective Security Treaty Organization”. Source: PJSC Scientific and Production Corporation "Irkut".